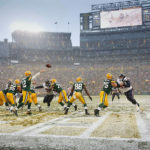 On a cold and rainy late fall night the Green Bay Packers defeated the Cleveland Browns 31-13 at Lambeau Field in an NFL football game in Green Bay, Wisconsin on Sunday October, 20th ,2013. 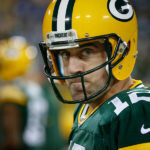 The Packers continue to “Keep Calm and Carry On” as coach Mike McCarthy would say, even though they have a number of key players out of the lineup due to injury. The Packers suffered another set back on Sunday when tight end Jermichael Finley was carted off the field with a neck injury. Here are my photos from covering the game. 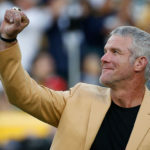 With Sunday’s win the Packers find themselves in first place in the division with two key divisional games coming up in the next two weeks in prime time against the Minnesota Vikings and the Chicago Bears who are also dealing with injuries to key players. 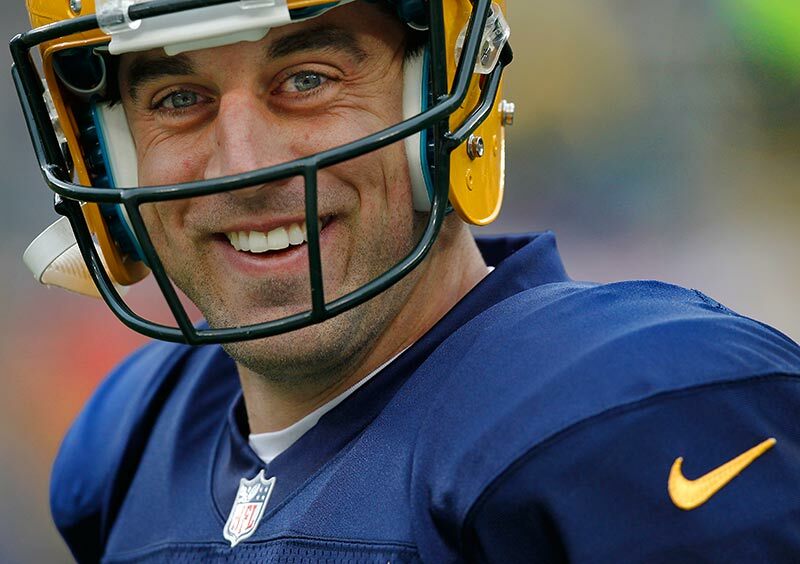 Green Bay Packers quarterback Aaron Rodgers smiles during warmups before the Packers Cleveland Browns game. 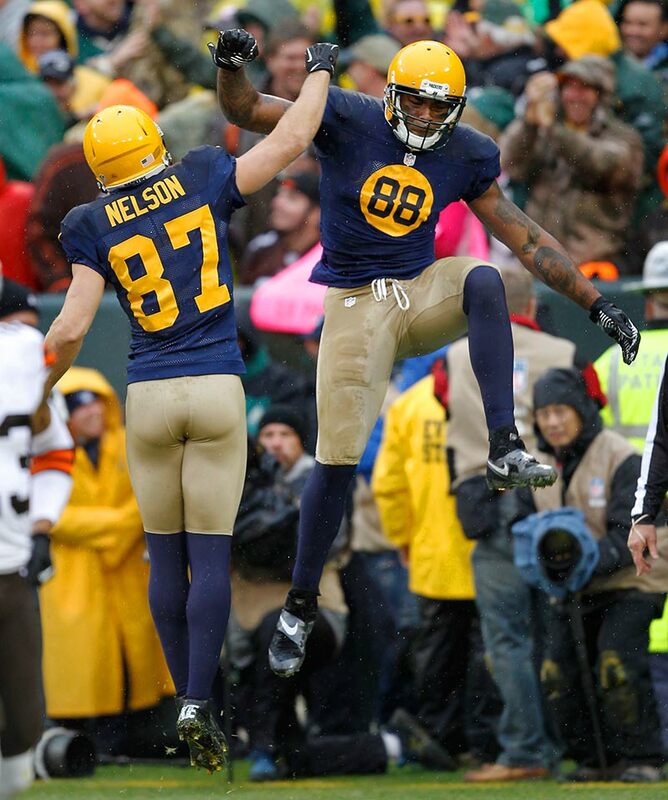 Green Bay Packers wide receiver Jordy Nelson and tight end Jermichael Finley celebrates Finley’s touchdown. 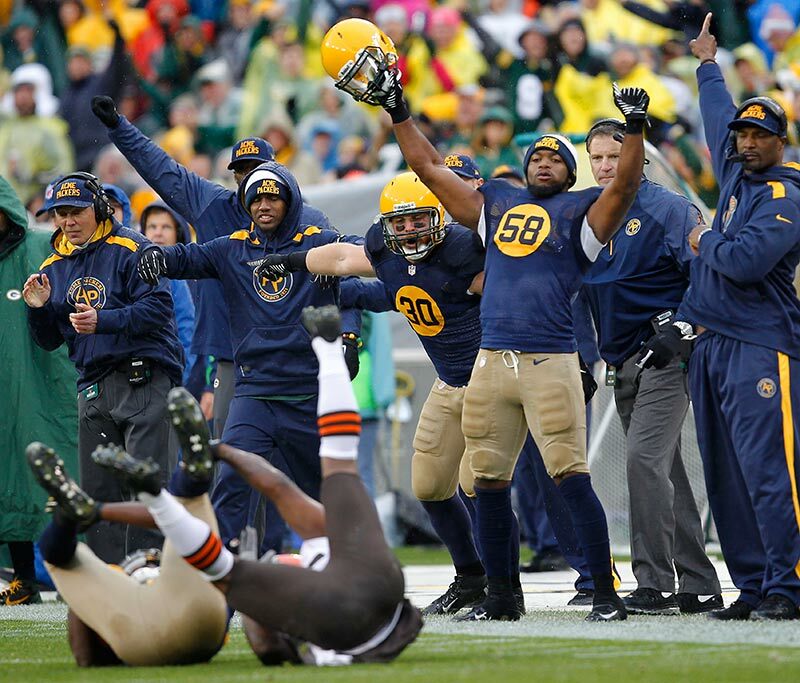 The Green Bay Packers bench celebrates an interception by Packers Davon House. 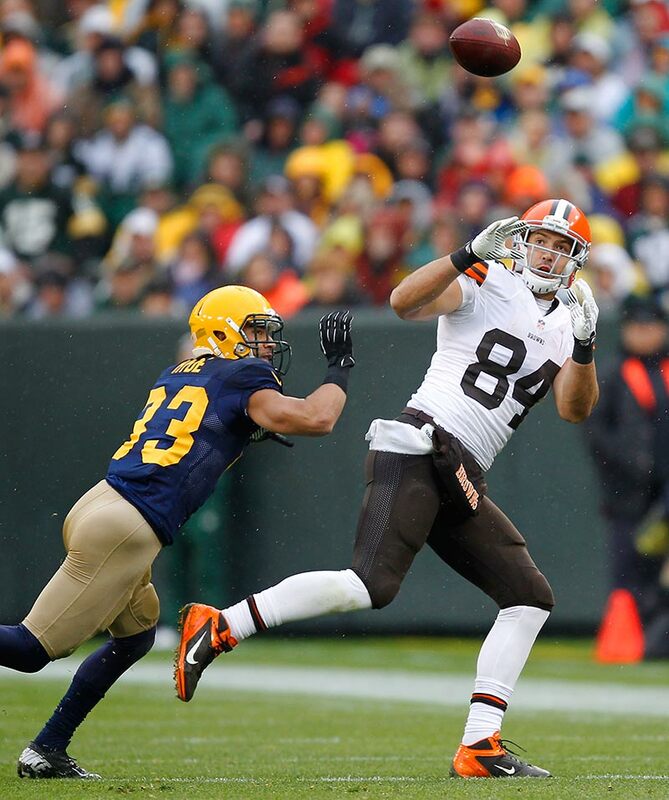 Cleveland Browns tight end Jordan Cameron tries to pull in a pass as Green Bay Packers cornerback Micah Hyde defends. 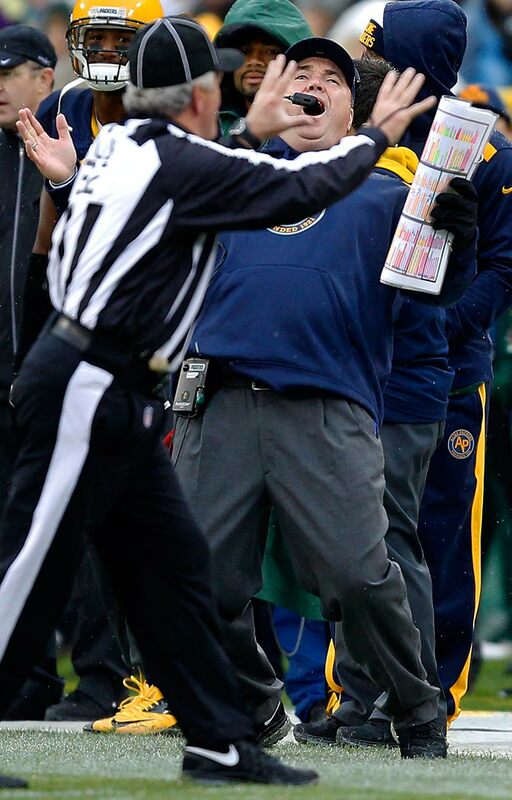 Green Bay Packers head coach Mike McCarthy reacts to a pass reception being called out of bounds. Cleveland Browns outside linebacker Paul Kruger and cornerback Chris Owens sack Green Bay Packers quarterback Aaron Rodgers. 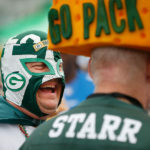 Green Bay Packers inside linebacker A.J. Hawk tries to sack Cleveland Browns quarterback Brandon Weeden, but gets called for a face mask penalty in the process. Cleveland Browns wide receiver Davone Bess focuses on pulling in a pass. Cleveland Browns outside linebacker Paul Kruger pressures Green Bay Packers quarterback Aaron Rodgers. 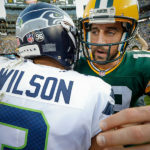 Green Bay Packers quarterback Aaron Rodgers walks behind a stretcher carrying Green Bay Packers Jermichael Finley off the field after the tight end suffered a neck injury. Green Bay Packers wide receiver Jordy Nelson helps Green Bay Packers wide receiver Jarrett Boykin celebrate a touchdown reception. Cleveland Browns Travis Benjamin gets tripped up on an 86 years kickoff return. Cleveland Browns Travis Benjamin celebrates his 86 yard kickoff return with Tori Gurley. Green Bay Packers defensive end C.J. Wilson and nose tackle Ryan Pickett celebrate their win over the Cleveland Browns with fans as they walk off the field.